After almost a month in Bishkek I finally managed to drag myself away as the Kazakh visa I had applied for some time ago started to run out. Unfortunately while I had been staying in Bishkek the weather had grown colder, quite a lot colder. In the day the temperature seemed to be around -20C rather more than I would like and this was inside a city, where it is normally warmer than on the road! Coupled with this it is always a lot colder on the bike because of the self generated wind chill as you ride along. At last I couldn’t put it off any longer and I had to set off, thankfully I was running a few kilos lighter than usual as I didn’t need to carry much food for what I hoped would be only two days of riding. I was expecting it to be quite tough as a month with very little exercise had left me feeling quite out of shape. 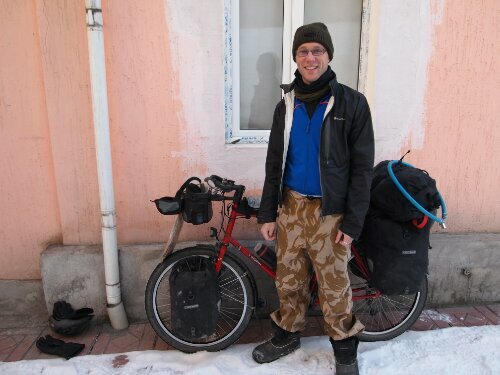 The first hour out of Bishkek was one of the toughest I had ridden, my hands were like icicles and I spent most moments wondering why I had left. After an hour I reached the border where I was able to warm up a little as it was inside mostly. This was the first border where I was wishing they would take a bit longer so I could put off hitting the road again. Sadly they were pretty efficient and I got through the Kyrgyz and Kazakh sides with no trouble as it wasn’t particularly busy. 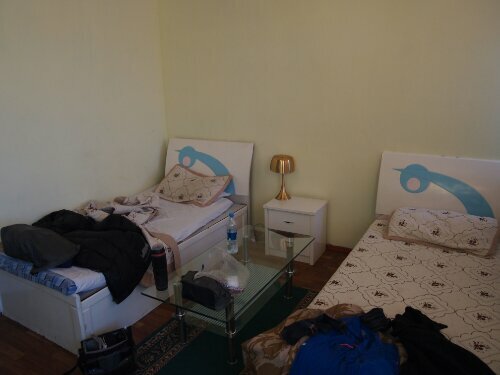 From websites and other travellers I’d heard a lot of bad things about central Asian border control. About people getting shaken down and interminable waits and unpleasant police. In my experience I had only met with kindness and help at the borders. The worst I had suffered was at the Kazakh/Uzbek border near Qarapalpakstan where I’d had to wait a while and had to go through the full process without being waved through parts, which is fair enough. By the time I had passed through into Kazakhstan the weather had improved a little and the sun was warming things up a little. I even felt a little cheery! As I’d ridden from the border a man had pulled over in his car and told me to get in. He kept saying he was alone so it was OK there was room and he looked at me like I was crazy for refusing. At that point I was feeling OK – I’d just had lunch and the day had warmed up a bit so turning down the ride wasn’t too hard. This was the second temptation of the day after a taxi driver had suggested I get a lift with him at the border. Just after the border a long steady climb that goes from 600m to 1200m began. Initially this felt OK as it meant I was warming up and after I had gone up about a quarter of the way there were some great views. I wasn’t feeling too bad, the only issue was that my leg muscles were starting to ache. This was pretty much the first time in the trip where I had begun to worry about my endurance. Before I’d worried if I was strong enough to power my bike up to certain places or that my knees were going to fail or that I’d be too slow to get where I needed to in the time frame I had. This was the first time I felt like I wouldn’t have the stamina for what I needed to do. I had to push on though as I was half way up a mountain pretty much in the middle of nowhere. As I kept on riding the climb didn’t seem to be ending either and it seemed to be going on further than I expected. Then the wind kicked in and I started to slow down more and to get cold as well. I wasn’t panicking though as I felt that the climbing must be nearly done. Then my third and final temptation of the day occurred as another car pulled over and the driver offered to help me in surprisingly good English. I refused again as I figured I couldn’t have much more of this to contend with. The man kindly gave me a yogurt drink and I watched him somewhat regretfully disappear into the distance. My regret grew as I continued and the weather worsened. The wind got worse and fallen snow was being blown up and around. Normally as I keep riding I get warmer as the heat from the exercise builds, now though it wasn’t enough and I could feel the wind drawing the heat off me and temperature gradually dropping. The mountain wasn’t ending either and it felt like I was riding for hours uphill in to freezing winds. I was yearning to reach the top and a respite from the strain of pushing against the wind. Then I got my wish and I started wishing I hadn’t. The descent down from that pass was easily the worst of my trip. The road was terrible to start with; slushy or icy for the most part so I had to sit on my brakes a lot of the time, even doing that I ended up going fairly quickly over terrain I’d rather have been crawling along on. This meant that the wind chill increased dramatically and I felt as cold as I have ever done in my life. I could feel the wind cutting through the thick leather of my gloves and freezing my hands so that I could barely feel if I was operating the brakes or not. My core temperature started to go down and I began shivering uncontrollably as I rode hoping that there would be a cafe or building I could seek shelter in soon. I started shouting to myself just to remind me I still could. Then I came round a bend and to my relief there was the sign for a cafe which I pulled into on my bike and then staggered into on my legs. Luckily they had a wall mounted heater, which I went and stood under to some strange looks from the patrons and staff, though no one questioned me. I was so numb it took about twenty minutes for me to be able feel the heat coming out of the heater properly and when feeling started to return to my hands I bent double with the pain. Once i’d warmed up a bit the owner gave me some tea and directed me to another cafe just down the road where I could sleep. This was lucky as night had started to creep up as I recovered and I did not want to sleep under canvas that evening. At the next cafe the lady said I was OK to sleep there and I brought my bike inside and made myself comfortable. I was just pleased to be somewhere warm. The next morning I woke early and got myself ready to set out. If anything it was colder this morning than it had been previously. I was more prepared though as I’d dug my balaclava out, stretched my leather gloves over another inner pair and started out wearing my down jacket over three cycle jerseys of varying thicknesses, my waterproof jacket and fleece. 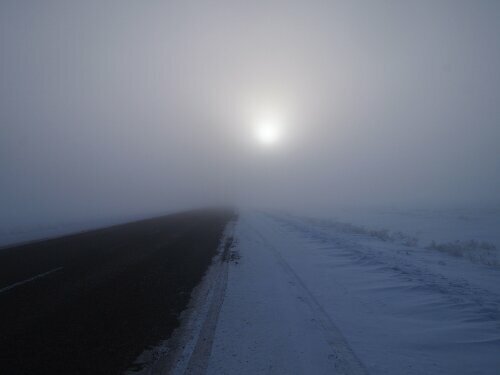 This was lucky as the area was blanketed in freezing fog. I was literally covered in ice. My bike, my jacket, my balaclava, everything. At one point I thought my eyes were going to freeze shut. Thankfully the ridiculous numbers of layers meant that as I rode my hands thawed and I felt warm in my core even if I was chilled on the outside. It was also very beautiful as everything else was covered in ice all around me. Another couple of cars stopped as I rode that day for people to give me gifts of food, which I appreciated greatly. Initially I had planned on riding from Bishkek in two days as it was only 230km. As the second day wore on it became clear that I wouldn’t be making it. Not only was the cold slowing me down but I was feeling exhausted, which was worrying as I hadn’t really ridden that far that day. I’d certainly learnt that if I was going to take a month to stay in one place I should keep up riding my bike. So as darkness arrived I pulled into a town and found a guesthouse to sleep at. The next morning when I came down to get my bike and set off I was put out to find that my bike was gone from where I had left it. Quite a lot flowed through my mind on seeing this. Where it could be, whether it had been stolen had, if it had been stolen at least I could get a bus now in the warm. Luckily it turned out it had just been moved into a room out of the way so I was able to continue. 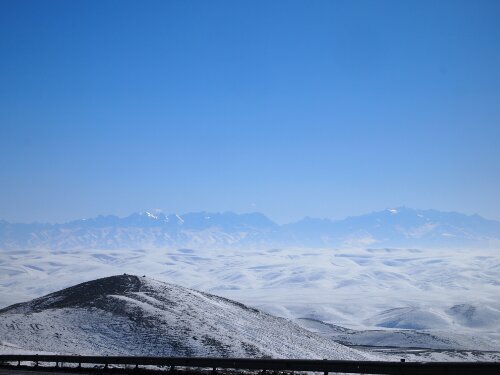 The initial start of the final 50km to Almaty was really tough. My legs felt like jelly and I was worried that I would shame myself and not be able to make this short ride. Fortunately after riding for forty minutes the muscles warmed up a bit and I was able to make it to the city in reasonable albeit achy time. Riding into Almaty itself was an experience as it is a pretty big city. Much larger than Bishkek and much scarier to ride into, even though I rode into Bishkek at night. After a few near misses and over an hour of stress I was able to make it into the calmer centre and rode straight to a bike shop where I dropped my bike off for a full service and to get it boxed up for the plane to India. I had my fingers crossed that this would be the end of winter riding. That view is amazing! But I don’t think I’d be able to handle the cold. 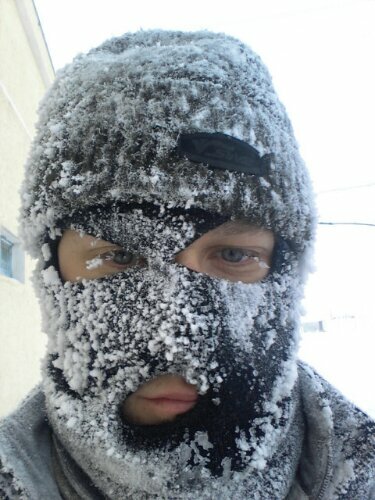 That photo of you with the balaclava is epic. Did you carry your cold gear from the UK or did you have it sent to you? A mixture actually – I had some cold gear with me, stuff that would be OK for down to freezing. 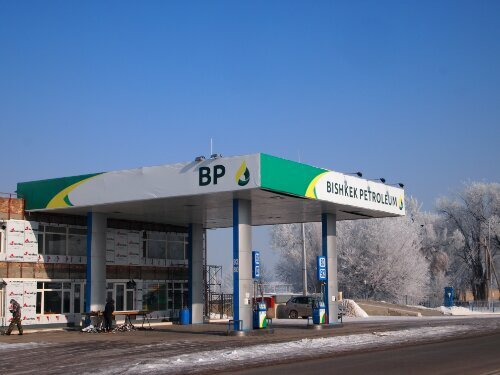 Then I had a down jacket sent out from the UK and bought some heavy duty cold weather boots and gloves in Aktau. If your tour includes Canada, you might be passing by us and if so, you have a place to stay (and maybe a companion rider for a few days). Thanks! Canada is definitely in the plans, where will depend on when and if I get there.